In a small bowl, add honey, balsamic vinegar, dijon mustard, garlic, fresh thyme, and salt. Using a whisk, mix together to combine. Set aside. To a large bowl, add brussels sprouts, asparagus, baby potatoes, red onion, cherry tomatoes and olive oil. Add 3 tablespoons of the honey balsamic mixture. Using your hands, toss all of the vegetables to coat them with the sauce. Spread vegetables out on baking sheet in a single layer. 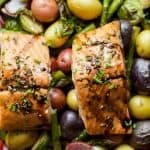 Place salmon filets, skin side down, on top of the vegetables 1″ apart. Brush the salmon with the honey balsamic mixture. Place baking sheet back in the oven and bake another 10 minutes. After that switch to broiler HIGH for 3-4 minutes to brown up the top of the salmon.